Museum collections in the UK need a new strategy, declared cultural historian Robert Hewison, in an article this February in Apollo magazine. He had been shocked to find the National Portrait Gallery in London closed to its usual 5,000 daily visitors earlier that month, due to being hired for a catwalk show for London Fashion Week. While understanding that 70 per cent of the NPG’s revenue has to be generated by its own entrepreneurial activities, Hewison wondered at ‘the irony of having to close an art gallery in order to keep it open’. He points out that, since the economic crash of 2008, funding for English museums has declined by 13 per cent. The Heritage Lottery Fund, which has bank-rolled so many of the museum openings and expansions of the past two decades, is suffering from declining ticket sales, and announced that 2018 will see a 40 per cent reduction in museum funding compared with 2017. Hewison’s suggested solution is that museums and their collections should not be treated as ‘a series of individual, siloed hoards in competition with each other, but as one great national collection, and as a great national responsibility’. In the unlikelihood of that grand and noble vision ever coming to fruition – especially as the UK enters another, probable Brexit-induced, age of austerity – more realistic advice comes from the Museums Association’s policy officer, Alistair Brown (also writing in Apollo magazine): what the sector needs to do, he said, in the face of this tougher climate, is ‘make the most of the 2,600 museums we already have’. But the clever museums are already ahead of the game, having embarked on ambitious new schemes to rationalise, refurbish and re-present their entire collections. When the V&A opened its Exhibition Road entrance and wing in 2017, showcasing Amanda Levete’s new gallery and porcelain-tiled courtyard, it marked the second phase and the 15th year of a 20-year investment programme, dubbed V&A FuturePlan, which has seen two thirds of the galleries at the Kensington site substantially upgraded or completely reinvented by some of the UK’s most interesting architects and designers. London exhibition design consultancy Metaphor worked closely with the V&A to develop the intellectual (and funding) strategy behind the entire programme, to ensure that these multiple and phased improvements would add up to a coherent and on-message whole. From London to Edinburgh, Birmingham to Vienna, this role is one that the UK’s exhibition designers are increasingly being called on to play – masterplanning entire collections, working together with curators to find the narratives of most interest to the diverse audiences – both specialist and general – so that everyone can appreciate the entire museum experience. Metaphor’s director for content and learning, Rachel Morris, says: ‘These are interesting times for museum-making. Since the mid 2000s Real Studios, another leading London-based exhibition design consultancy, has helped to clarify the narratives and collection displays for a complex and ambitious refurbishment and restoration programme across all the National Maritime Museum’s buildings in Greenwich, also designing major exhibitions across the site, including 2011’s Voyagers, an innovative, multimedia ‘taster’ exhibition, drawing out personal stories and narratives relevant to the whole museum collection, in the foyer of CF Møller’s contemporary, £36.5m Sammy Ofer wing. But helping smaller regional museums to make more visual and narrative sense of their collections is, arguably, even more important. Schemes that Real Studios and Casson Mann – another significant London consultancy – have devised for less high-profile cultural institutions can play a vital role in turning fusty institutions into community assets. The Beaney House of Art and Knowledge – a quirky Canterbury museum – has been revived and restored by Casson Mann’s 2013 masterplan and redesign, which celebrated the more prestigious items (a collection of the work of celebrated cattle painter Sidney Cooper, for example) with the quirkier elements – stuffed birds, Greek vases, regimental trophies and Siberian maps. The latter introduce the museum, arranged in a huge cabinet of curiosities, while other galleries separate the ethnographic items from the decorative. In each gallery, a central social space facilitates the ‘staff explorer’ programme: boxes of handling items can be lifted off walls and their contents examined at nearby tables, whose drawers are also stuffed with objects and investigative tools. Meanwhile, further west, the Dorset Museum has just won £17m of Stage 2 Heritage Lottery Funding, in part thanks to Real Studios ‘client rethinking and reinventing,’ as co-director Yvonne Golds calls it. In its current form, says Golds, Dorset Museum is ‘the usual sort of Victorian building with mid-20th-century additions; it’s quite cobbled together. It is preparing a really ambitious renovation, getting rid of a lot of 20th-century extensions and building new galleries, a new atrium and connecting the buildings at the front with a property it owns at the back. That will give four permanent galleries, and a bit of temporary exhibition space as well. ‘It will have a geology gallery, a people’s gallery, a fine art gallery and a Thomas Hardy gallery, because it has his archive. They are amazing collections, really, quite extraordinary,’ adds Golds. So how has Real Studios’ input helped to clarify the content? Says Golds: ‘The museum had ideas for how it wanted to divide their collection, which we haven’t moved away from completely but what we are keen to do is mix the collections a little bit more. When we’re looking at geology we are bringing in a lot of social history – people like Mary Anning (an important local fossil finder), of course, but also lots of scientists. They have some early 20th-century fine art collections that support that. So it’s not just a geology-based approach. With Carmody Groarke in charge of the refurbishment and extensions, the new museum should open in 2020. 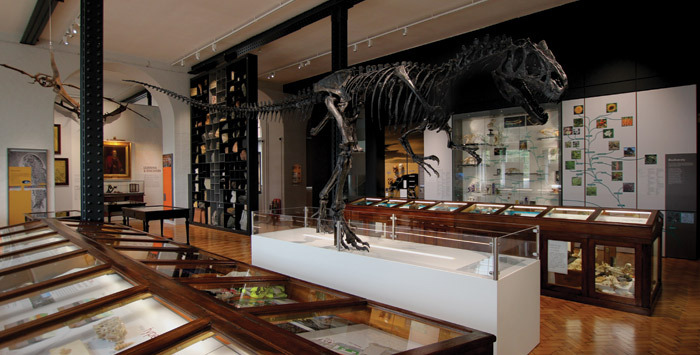 In the meantime, Real Studios’ work at Birmingham’s Lapworth Museum has helped to transform audiences and impact (see case study) within yet another important branch of the museum sector – those attached to universities. As with every design discipline, an exhibition designer’s fundamental skill is to act as a fresh pair of eyes. As Golds says: ‘When you know so much and you are living and breathing it every day it’s hard to step back and know how best to tell your story. We are able to come to it quite objectively. In many respects, it’s good to know nothing. You see through to what are the key messages, and how to knit the whole thing together so it makes more sense for a general public or specialist. You put these information blocks in place and then other topics slot in beneath them. The Lapworth Museum – shortlisted for the 2017 Art Fund Prize – has doubled visitor numbers since it opened. One way to ensure greater unity of presentation throughout is for architects and designers to work more collaboratively. This still happens rarely, but when it does, the results are noticeable. It is tangible in the unity of colour and material palettes at Vienna’s Weltmuseum, recently transformed by Ralph Appelbaum Associates (RAAI) and Hoskins Architects (see case study). 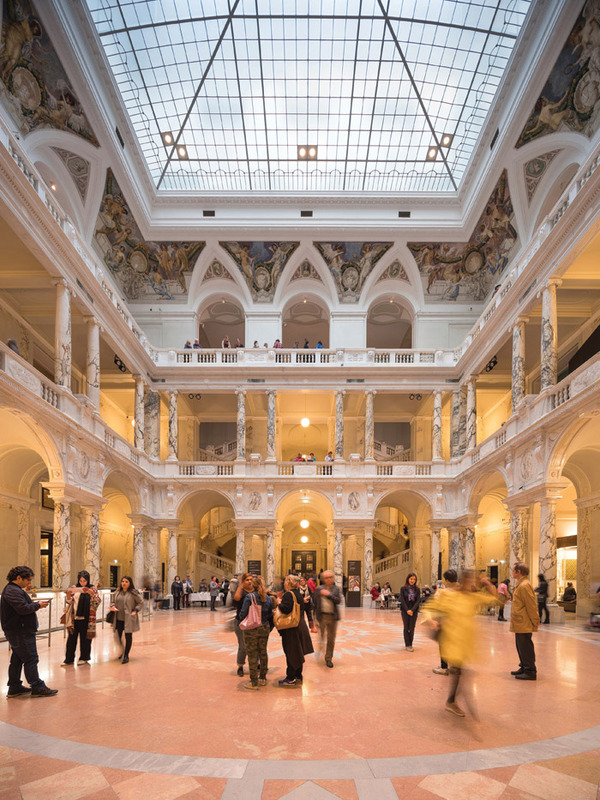 Having worked together on the original masterplan and refurbishment of the National Museum Scotland, the first phase of which opened in 2011, they bid jointly to land the project of reinventing Vienna’s Ethnographic Museum as the Weltmuseum. Tim Ventimiglia, director of RAAI Berlin, says: ‘We worked symbiotically. Hoskins is really an expert in making complicated buildings accessible, friendly. They are not so much about [stamping a] visual signature on their work but about smart solutions. Together we developed a formal language of materials and colours and treatments in the building that are complementary, a common language. There is a deliberate delineation between the historic fabric – parquet floors, decorative ceilings – and modern elements. Another gallery investigates ‘the movement of people, objects and ideas around the world. Migration is a big topic in Europe right now. To talk about influences of one culture on another – this hall is all about that. What unites these galleries is that it’s all about people, interactions’. And in this way, an old-school, classic museum can suddenly, wonderfully, become a vital place for encouraging debate and dialogue about the ethnic, national and other influences and schisms that are dividing the world we live in now. There’s relevance for you. There are few museum galleries as spectacular as the 2,165 sq m central entrance hall of London’s Natural History Museum (NHM), Alfred Waterhouse’s 1881 Gothic Revival palace in Kensington. 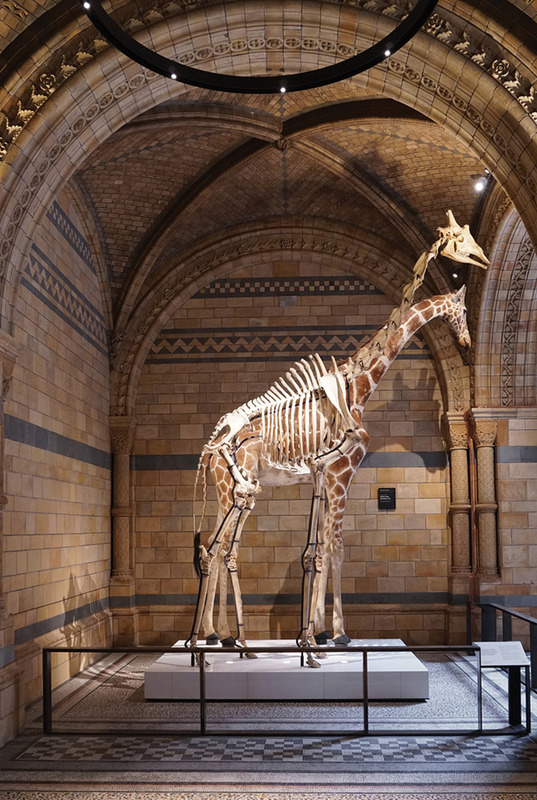 But after 35 years of being dominated by the huge and much-loved model of ‘Dippy’ the Diplodocus, with little else in this vast, triple-height, space to flag up the wealth, depth and breadth of the museum’s collection, in 2017 a new version of the newly renamed Hintze hall opened, masterplanned and designed by Casson Mann. The practice’s winning pitch for the project focused on celebrating the architecture – the terracotta brickwork, carvings and mosaics – while inserting sympathetic and iconic elements at key points on each level, to advertise the treasures beyond. 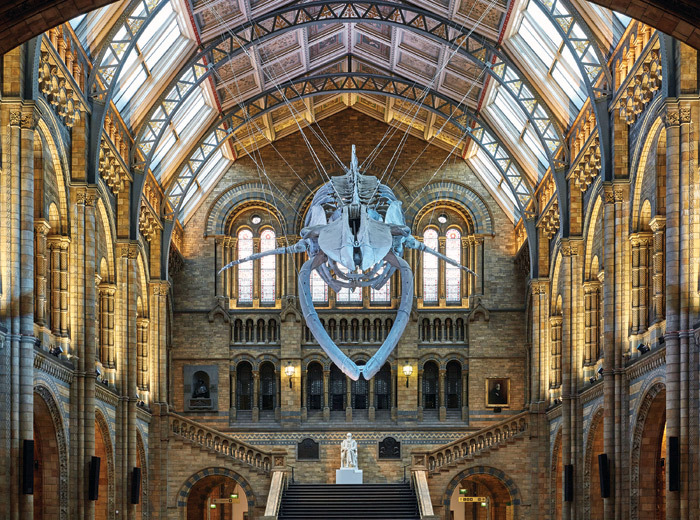 First move was to replace Dippy (after all, it was only a cast, and the museum’s 21st-century brand is all about authenticity) with a 24m-long blue whale skeleton, diving down from the roof, as if to greet the visitor, while drawing attention to the stairs and upper galleries with a flick of his tail. Suspended by wires, he frees up the space below him for a large visitor information and ticketing desk, which doubles up as a bar, for the NHM’s economically crucial events programme. A major clean-up of the hall was instigated, removing clutter and decades of dust. A new lighting scheme designed by DHA and Casson Mann now emphasises the graceful arches and ornaments that proliferate across walls and ceiling. Existing alcoves along either side of the hall – dubbed ‘wonderbays’ – are now host to a single star exhibit from the museum’s collection, referencing each of the departments. They are divided into life sciences (biodiversity), to the west, and earth sciences (origins and evolution) to the east. One of the other objectives was to draw people up to the first floor. So the arches along the balcony also frame grouped exhibits, mounted in monumental 5.5m-high displays so that they are clearly visible from the ground floor. Assorted birds, beasts and rocks are arranged in eye-catching, sculptural forms, dramatically silhouetted against the tall, arched windows behind them. The second-floor balconies are more reflective spaces, giving a unique perspective on to the architecture, both visually and intellectually, with displays revealing how Waterhouse’s and Richard Owen’s architectural and scientific vision combined to create this unique structure and resource. 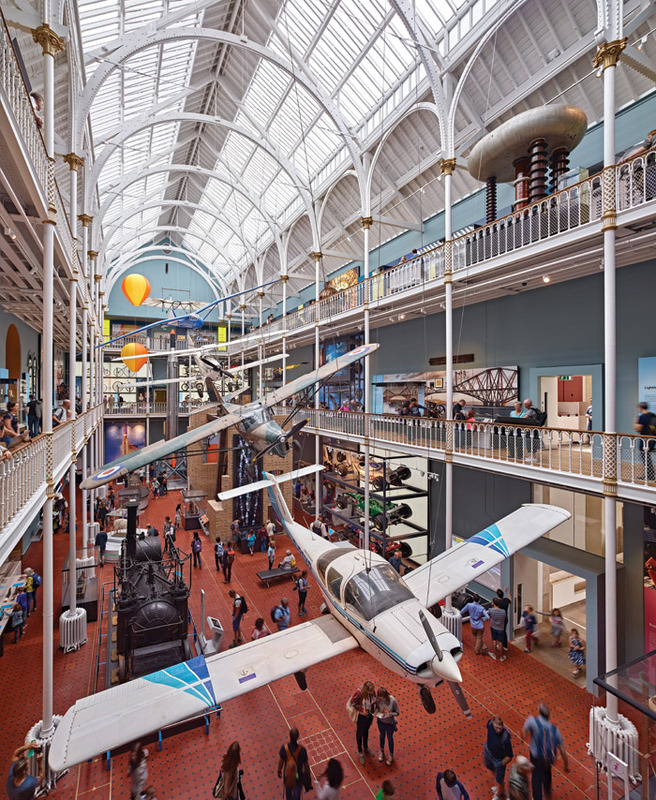 The transformation of the National Museum of Scotland in Edinburgh over the past decade has brought 40 per cent more space to the collections within its Grade A listed Victorian building and united a vast and varied collection through 21st-century interpretation and design. In 2011, Phase One completed: Hoskins Architects’ £48m refurbishment and enhancement of the original Victorian structure, which attached the 19th-century museum to its Nineties’ sibling, added 16 new galleries and opened up dramatic new public spaces; along with 10 new natural history and ethnological exhibition galleries designed by Ralph Appelbaum Associates. 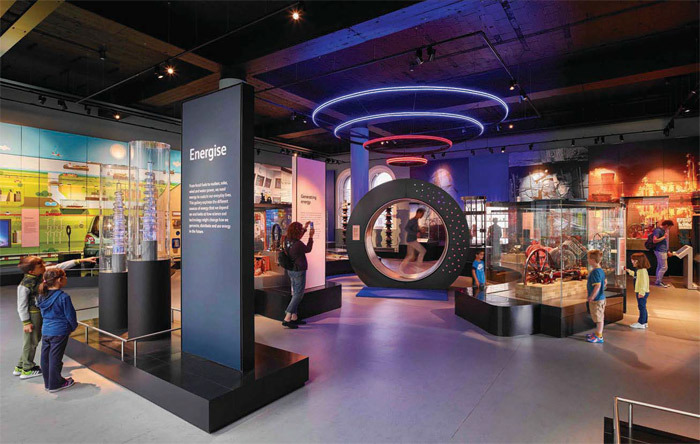 In 2016, Phase Two launched, with 10 new galleries designed and masterplanned by Metaphor: six new science and technology galleries and four decorative arts galleries. Working closely with the curatorial teams, Metaphor developed a clear methodology for the key stories, the overall ambitions and the audiences for each gallery. Weaving the exhibitions across the double height, daylit atrium, Metaphor paid close attention to pacing and choreography, both within each gallery and across the whole space. A clear hierarchy of singular iconic items – a Bolton and Watt steam engine, a Hadron Collider model, and a spectacular aerial display of early aircraft, arranged in dynamic positions within the atrium space – flag up each section, providing visibility across the gallery. At the same time, these icons are supported in their own rich landscape of smaller displays, film and interactive elements. Some 60 interactives are offered across the galleries, including a giant hamster wheel, which visitors can physically propel in order to understand how kinetic energy works, and a game that allows visitors to create their own digital genetic tests. Historical vehicles throughout the science galleries flag up firsts in engineering, from the first British motorbike to the first steam locomotive and the first hydrogen car. Cutting diagonally across the decorative arts galleries, a catwalk shows highlights such as the Jean Muir collection, while films are projected on to tall plexi-banners above, exploring fashion from bespoke tailoring to mass manufacture. Interactives encourage visitors to explore the nature of body image and how it has changed through the ages. Nearby a gallery on making and craft showcases the rich traditions in Scotland, from weaving to ceramics. In 2017 it won Best Permanent Exhibition at the Museums and Heritage Awards and the Dibner Award for Excellence in Museum Exhibits. Birmingham University’s Lapworth Museum reopened in summer 2016 with three state-of-the-art new exhibition galleries, set within the Grade II listed Aston Webb building. With interior spaces opened up, restored and refurbished by Associated Architects, the world-class collection of 250,000 objects – named after English geologist Charles Lapworth – is now showcased within three clear and distinctive but interconnected narrative galleries, devised by the curatorial team with Real Studios: the Evolution of Life (incorporating Learning & Discovery – a history of collecting); Active Earth; and Mineral Wealth. Real Studios’ interpretation works hard to make a complex and vast collection intriguing and accessible, using layered narratives and striking imagery to reveal both the bigger picture – the role that mineralogy has played in our understanding of the planet’s evolution – and smaller stories, such as the beauty of the specimens themselves, and Professor Lapworth’s contribution to the discipline of geology. Taking advantage of the grand scale of these newly stripped-back and opened-out Edwardian spaces, Real Studios wove into the displays the kind of interactive, tactile and sculptural elements that improve impact and engagement. In the Mineral Wealth gallery, for example, a 6m-long display table has been laid out with specimens organised not just by category but by colour, creating an attractive chromatic feature. In the biggest gallery, the former Engineering Hall, a ‘rock wall’ 5m high by 3m wide features rock specimens that visitors can touch and investigate, slotted into an open-grid shelving unit. The project included a new, welcoming reception area, a shop, toilet facilities and a substantial education space, which brings outreach and teaching facilities to the gallery for the first time. 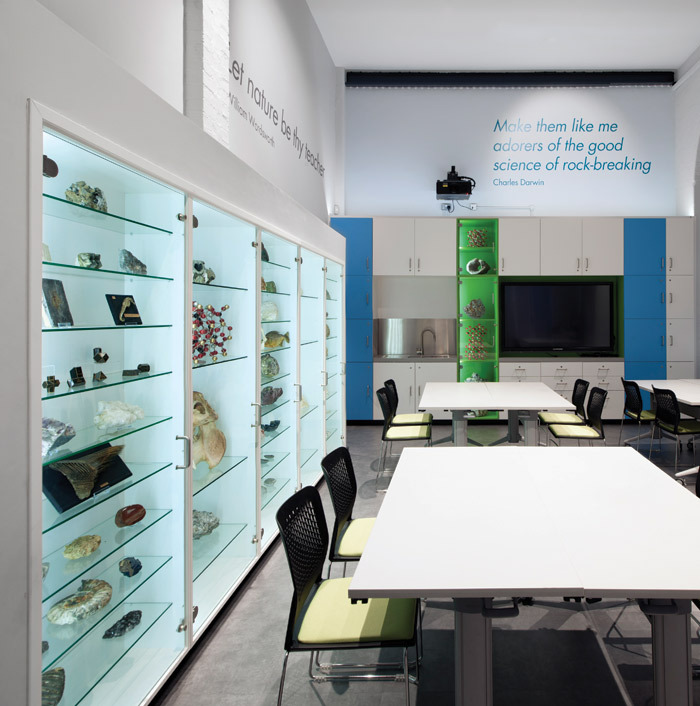 Equipped with one of the latest stereo-microscopes, it allows students and visitors to get up close and personal with items from the surrounding collection. In an ornate 19th-century extension to the Royal Palace complex that frames Vienna’s main historic square, the former Ethnological Museum was founded in 1910 to house the then ruling Archduke Franz Ferdinand’s extensive collection of ethnic artefacts trawled from his travels through Africa, South America and Asia. Closed in 2014, it had, since the Nineties, been the subject of intense debate as to what role such a museum could play in the modern age, without supporting the unsavoury ‘white suprematist’ narrative of its original era and format. Won as a joint competition bid by Hoskins Architects’ and Ralph Appelbaum Associates’ (RAAI) Berlin offices, the new Weltmuseum (world museum) was conceived as a ‘necklace of stories’, which explore what unites as well as what as differentiates world peoples and their cultures. Arranged around a central columned hall, 14 individual galleries fall into two categories: one a more purist presentation of the objects themselves (‘collection halls’), the other around concepts (‘concept halls’) such as religion – from the story of Himalayan Buddhism told through the collection, to the Catholic church’s sponsorship of expeditions around the world through its missionary work. The different overall themes are articulated both in colour and display style. The concept halls are white, abstract, multimedia and modern. The collection halls reuse original but refurbished black steel showcases built in 1907, set against dark walls, with low lighting and backlit captions to eliminate glare off the glass cases. New display architecture mimics the proportions of the original cabinets’ thin-frame construction, albeit in powder-coated steel (coloured white for the concept halls or anthracite for the collection). Despite these two distinct themes, each room tells its own story, while a fairly free-form circulation route allows access into galleries from four different points. Social engagement and education are encouraged, with giant media tables in the concept halls big enough for groups of up to 30 to explore topics and archives further. Hoskins’ interventions have emphasised the beauty of the original building while opening up pathways and improving legibility between galleries. They have also created a new permanent 1,000 sq m exhibition space on the mezzanine floor, plus a ground-floor event space achieved through connecting the museum building with an adjacent wing of the palace. Along with cafe, shop and visitor facilities, a glazed outdoor Media Cube has been added, intended as a summertime film, event and theatre space and bar.